Do you find yourself putting way too much effort into curling your short hair in the morning? Well then maybe it’s time for you to consider switching curling irons. The right curling iron can make a huge difference in the amount of effort it takes to curl your short hair. Some curling irons like this one from Kiss Products we have been told even make curling short hair almost effortless. That certainly got our attention enough that we decided we needed to do a review of the Kiss Products Instawave Automatic Hair Curler. The dual directional auto-rotating barrel on this curling iron is quite a unique feature. It will definitely save you a lot of work when you are curling your hair. That is why so many professional stylists use curling irons that have this very same feature. With just a quick press of a button, you can easily be curling hair in either direction. There are only two temperature settings on this curling iron model. The max temperature it can be used at on the high setting is 420°F. On the Kiss Products Instawave Automatic Hair Curler, there is no spring clamp to catch your hair but it does have some small spindles near the handle that will catch and curl your hair when its 1” barrel starts to rotate. 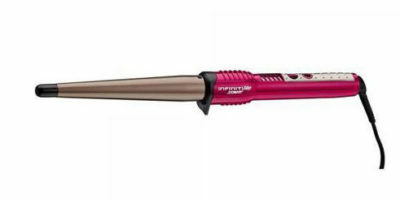 The barrel of this curling iron is ceramic infused so it heats evenly and leaves your hair with a little more shine. This is by no means a fancy curling iron with many bells and whistles. There are no digital readouts or digital heat settings on it. You select the temperature you want to use it at by simply selecting one of the settings on a 3-position switch (high, low, off). It comes with a standard size 8-foot power cord with attached swivel end. There are not a lot of safety features on this curling iron either but it has the important ones. It features a 90-minute automatic shutoff and there is also a raised area in between the barrel and handle that serves as a heat shield. It has much to do with the design of the spindles. All you have to do is hold this curling at a slight angle close to your hair. Once you position your hair so it touches the spindles on the barrel it will automatically roll and curl your short hair. Curling short hair will never be done easier than when you use this Kiss product curling iron. The Kiss Products Instawave Automatic Hair Curler is also very lightweight and compact. This compact design also helps you to be able to get in close to your scalp and position the barrel to curl your shorter hairstyle. The warranty on this product is pretty average for its price range. Kiss Products backs this curling iron up for a period of two years. As far as warranties go the terms are pretty straightforward which is nice. Of course, we had a few complaints about the Kiss Products Instawave Automatic Hair Curler. For one, it only has a high and low heat setting. We definitely like to see more variety than that in any curling iron that is used on short hair. There was also an issue with the barrel. It is a constant 1” diameter throughout the entire barrel. Again that does not give you a lot of variety in the types of curls you can put into your short hairstyle. 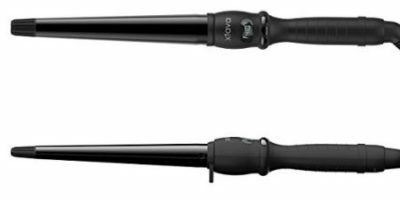 This is certainly a curling iron that makes curling your short hair effortless but don’t confuse that with meaning it’s a fancy curling iron. There really is nothing fancy about it and its heat setting choices are extremely limited. It does, however, do exactly what it was designed to do and that’s to curl your short hair without having to move your arms or wrists much. So if you are tired of putting a lot of effort into curling your short hair or have a medical condition that prevents you from doing so, you may want to strongly consider purchasing the Kiss Products Instawave Automatic Hair Curler.